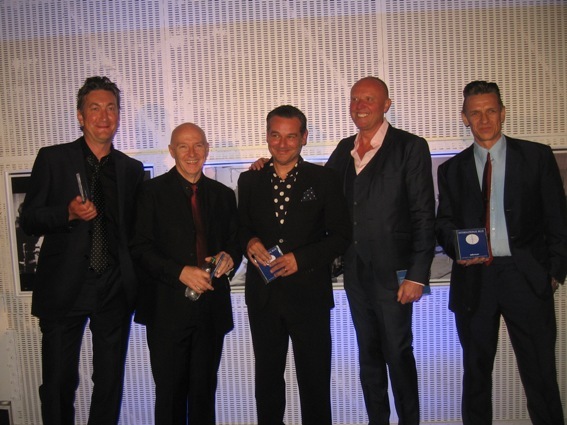 Dutch composer Stephen Emmer’s new album ‘International Blue’ was launched at the world famous Abbey Road Studios with a special live revue featuring its four vocalists Glenn Gregory, Neil Crossley, Liam McKahey and Midge Ure. 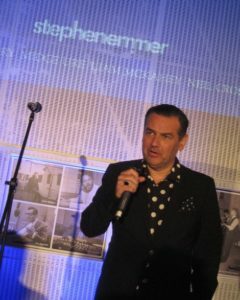 The album is in Stephen Emmer’s words “a humble, but yet ambitious project”, bringing back “the lost art of crooning”. 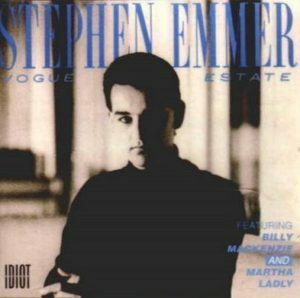 Produced by Tony Visconti whose credits have included David Bowie, Marc Bolan and Morrissey, the studio legend first picked up on Stephen Emmer’s music via MySpace. Unable to be present at the event, via a video address, Visconti discussed how he first worked with the Dutchman on the 2008 spoken word album ‘Recitement’ which featured none other than Lou Reed and how he fell in love with Emmer’s cinematic style of composition. He described the songs on ‘International Blue’ as being “well written from a deep tradition of classic standard songwriting” that have “the signature of the crooner stamped all over it”. “The songs are off the beaten track” he added “and not straightforward love songs”, concurring with Emmer’s view that there has always been a spiritual connection between the vocalists of the Post-Punk era and the classic singers of the past such as Frank Sinatra and Scott Walker. A big cheer greeted Midge Ure as the diminutive Glaswegian jokingly manhandled a mic stand clearly set up for the considerably taller Glenn Gregory! His track ‘Taking Back My Time’ is clearly an emotive statement of intent on Ure’s part. His adoption of a lower vocal register affirmed his love of Scott Walker which has been well documented via his 1982 cover of ‘No Regrets’ and ULTRAVOX’s own string laden ‘All In One Day’ in 1986. Coincidentally, his first solo album of new material in 12 years called ‘Fragile’ is out soon. Liam McKahey returned with ‘Mama’s Mad’, another excellent Bowie / Walker hybrid complimented with a dash of MASSIVE ATTACK. 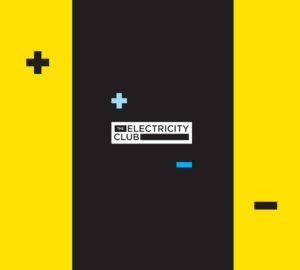 With his own music leaning towards Americana, he clearly found crooning again a re-enlightening experience back to his COUSTEAU roots; he even revealed an interest in collaborating within the field of laid back electronica; “I really like ZERO 7… their music lends itself to good singing” he later told The Electricity Club. 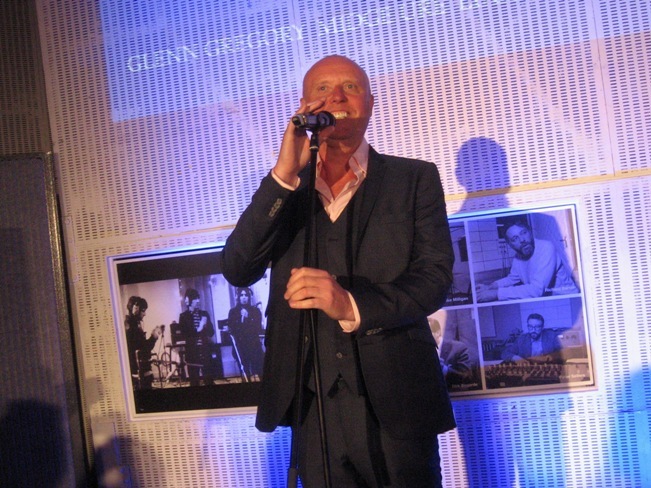 The showcase concluded with Glenn Gregory giving a spirited rendition of ‘Let The Silence Hold You’, the second of four tracks featuring his dulcet tones on ‘International Blue’. Indeed, Gregory’s songs on the ‘International Blue’ album are perhaps the ones which the album hangs itself on. ‘A Break In The Weather’ for example reimagines ‘Wild Is The Wind’ as a John Barry era Bond theme, while ‘In The Mirror Reflected’ captures the spirited piano intro of Dusty Springfield’s version of ‘Going Back’ and references ‘To Sir With Love’ in the chorus. You were in the band MINNY POPS who supported JOY DIVISION in 1980 at that gig in Bury where the riot took place? Shortly after that, the audience got onto the stage and showed their dismay that Ian Curtis wasn’t going to perform by having some huge fights in the corridor by the dressing room! We could hear all of it but luckily, we had our door barricaded! When it was all over, we came out and that was that. We didn’t think much of it at the time, but it was only later that this whole anecdote has become of such cultural significance. Really, it was just an evening with a bit of an incident that has become part of rock history! However, MINNY POPS are not included in that scene from the ‘Control’ film, but the director Anton Corbijn… he got to know JOY DIVISION through us!! You have four great vocalists on ‘International Blue’, but would Ian Curtis have fitted in with this project had he been around today? That’s a good question, I think so… the sonority of New Wave singing with electro bands has always intrigued me. I was a part-time journalist then back in Holland with a magazine called ‘Vinyl’, but nobody within journalism ever saw the relationship between these singers like Ian Curtis doing things like ‘She’s Lost Control’ with that low voice and Frank Sinatra… it’s like Sinatra but more dark! So it dawned on me that these singers, they should perform that kind of material and I could write for them. And that’s how ‘International Blue’ got started. It’s a bit more remote from New Wave but still a little electronic alongside the orchestral; it is very logical that these are the kind of singers who suit this genre best. You started as a guitarist with MINNY POPS, so how did you branch into orchestrations? Are you classically trained? 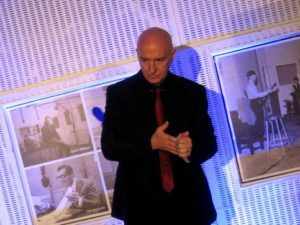 No, I’m not… after all the electronic pop music I did with ASSOCIATES, THE LOTUS EATERS and ACT in the UK, I went back to Holland doing assignments for TV themes, documentaries, film and commercials. What I learnt there was you have to arrange in every genre. Tony Visconti gave me a great compliment and said “Stephen Emmer as an arranger and composer, knows the rules best through that experience in media music – so he also knows how to use, or not use a cliché in music”. So I made a very thorough study of arranging with an orchestra, although my pedigree is in electronics. I had a solo record in 1982 called ‘Vogue Estate’ which featured Billy Mackenzie and Martha Ladly. It was produced by Michael Dempsey who was in THE CURE and ASSOCIATES with this young guy called Flood who is now a legend! Is there any other New Wave vocalist you would like to have worked with on ‘International Blue’? Yes, in fact I bumped into him last night as we were eating in the same restaurant… he was on my list but it didn’t come off! I’d never met him before but I decided to go up to him… it was Ian McCulloch of ECHO & THE BUNNYMEN. He has this Jim Morrison type of voice that I would like to work with… so we might do so in the future. The album’s lead single ‘Untouchable’ is about Billy Mackenzie. What was it like working with him? Warner Brothers had invested a lot of money in him and thought he would become the next David Bowie, but he was more of an artist’s artist. He suffered from being pushed into the realm of bigger gigs and all of that. It’s a shame, because out of most of the vocalists of that period, only he could take a TR808 and have a vocal battle with it… which vocalist would do that? He was great! If Billy Mackenzie had been able to adopt a more conventional approach to being a pop star, do you think ASSOCIATES could have been as big as A-HA? I think so… coincidentally, Morten Harket recently asked me to write a song for him.